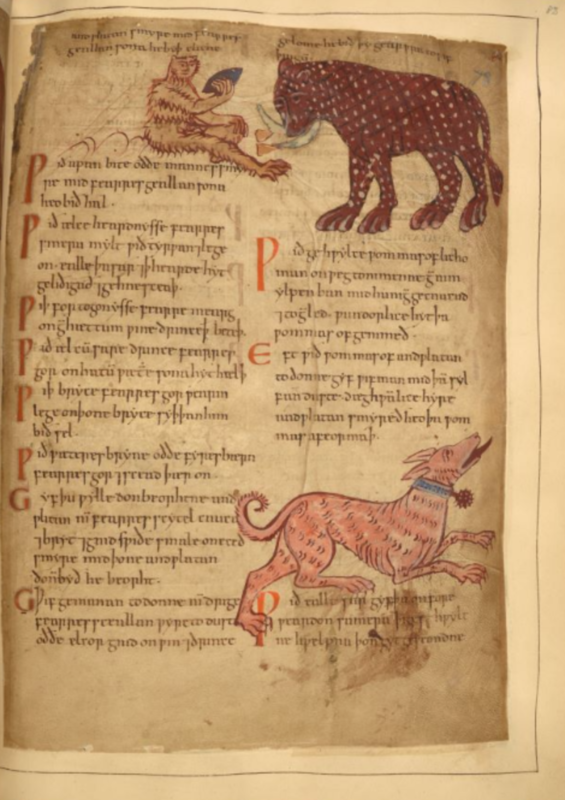 The manuscript's Old English is actually the translation of "a text which used to be attributed to a 4th-century writer known as Pseudo-Apuleius, now recognized as several different Late Antique authors whose texts were subsequently combined." It also includes "translations of Late Antique texts on the medicinal properties of badgers" and another text "on medicines derived from parts of four-legged animals." (Somehow one doesn't imagine those latter sections playing quite as well with today's alternative-medicine market.) 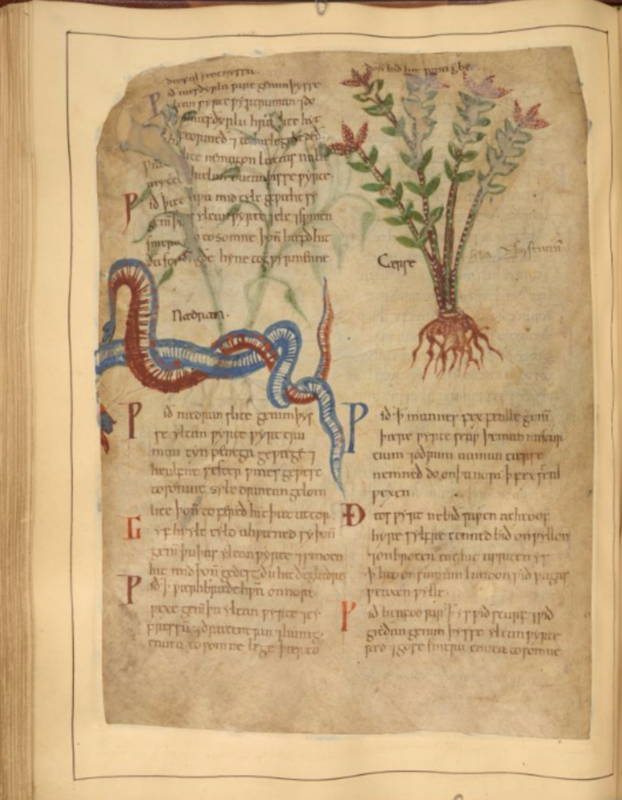 Each entry about a plant or animal features "its name in various languages; descriptions of ailments it can be used to treat; and instructions for finding and preparing it." 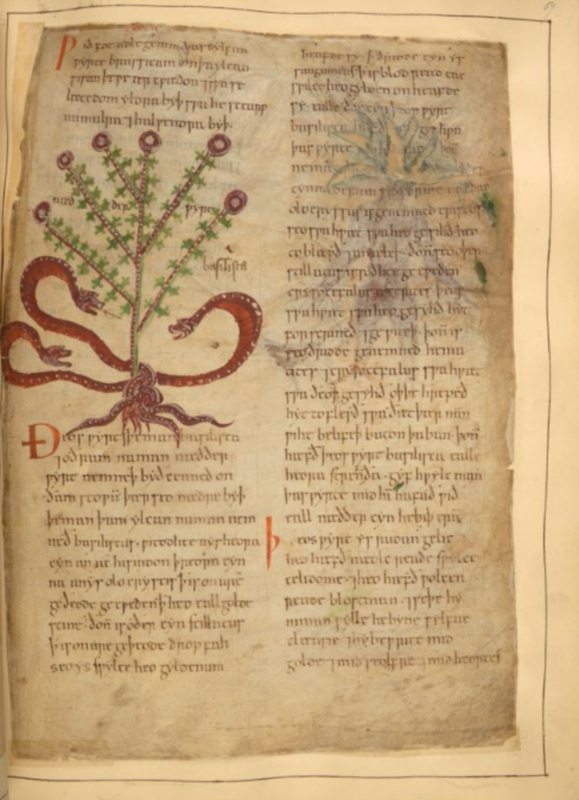 Quite a few of the species with which the guide deals would have been directly known to few or no Anglo-Saxons in those days, and some of the entries, such as the one describing dragonswort as ideally "grown in dragon’s blood," seem more fanciful than others. 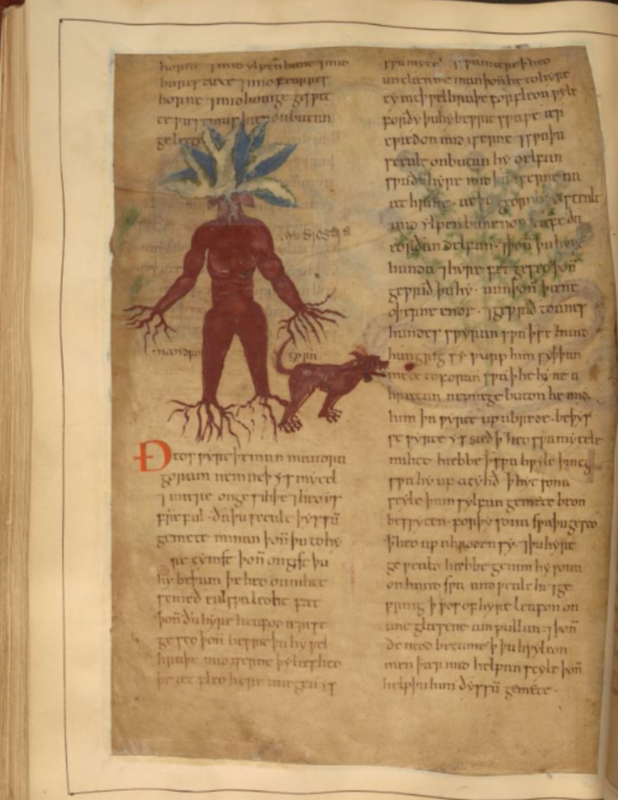 As with many a Medieval work, the book freely mixes fact and lore: to pick the mandrake root (pictured at the top of the post), "said to shine at night and to flee from impure persons," the guide recommends "an iron tool (to dig around it), an ivory staff (to dig the plant itself up), a dog (to help you pull it out), and quick reflexes." You can behold these and other pages of the Cotton MS Vitellius C III in zoomable high resolution at the British Library's online manuscript viewer. While the remedies themselves might never have been particularly effective, their accompanying illustrations do remain strange and amusing even a millennium later — and isn't laughter supposed to be the best medicine? Based in Seoul, Colin Marshall writes and broadcasts on cities and culture. He’s at work on the book The Stateless City: a Walk through 21st-Century Los Angeles, the video series The City in Cinema, the crowdfunded journalism project Where Is the City of the Future?, and the Los Angeles Review of Books’ Korea Blog. Follow him on Twitter at @colinmarshall or on Facebook. Unfortunate the tone at the latter, as if the history and use of medicine prior to the 20th century is laughable…it is not. They recently tried one of those ancient remedies on modern patients and 85% of them got well. We will decimate the forests and jungles nor even quicker. Better when it was known to only those who respect the natural bond of earth and its creatures – us included- healing each other. THANK YOU FOR THE HERBAL TREASURE! I would absolutely love a copy please. Have relied in the past on grandma’s knowledge or other I have gathered over the years this would be a real go to treasure. I would love a copy. I would absolutely love a copy please. I am a botanist and Horticulturist and part of a physic garden group so Iw would love a copy. Can I have a copy of the ancient medicinal please. I would love to have a copy of this manuscript as well please. I am very interested in receiving a copy. Looking forward to this read. How do we get a copy? I am all for naturalremediesvs big corrupt pharmaceutical. PromiseI respect this knowledgeand hold it sacred. I would like a copy too. Very interested in this. How can we get this in print? What a wonderful find. I would absolutely love to receive a copy. Beautifull, van i receive a copy too please, thank you so much. I would greatly appreciate a copy. Is there also a modern English translation? If not, no worries, my husband can mostly ready Olde English. Thank you. Is there a readable translated version of this manuscript. I am unable to decipher the script and language. Would love an English translated version please!